Let me take you back in time to the year 2000, sixteen years ago. I was still working as a stripper, but was to the point where I wanted to stop. I knew God wanted me to stop, but I wasn’t exactly sure how I was going to do it. I was no stupid girl by far, but at this point I only had my high school diploma, some college and some work experience, but not on the level where I could make a living wage. I was used to living a certain way, and I wasn’t trying to get unused to it! To be clear, I wasn’t living an extravagant lifestyle, but I was stable and comfortably affording rent, car note, food, and my personal needs. I am not promoting that industry at all, it was wrong and I would never do it again, but it was what I needed AT THAT TIME. It allowed me to grieve. I could work when I wanted to, and when I needed to lay there and cry or be depressed or go through whatever I needed to go through, I had the freedom to do that. But now after three years, I didn’t want to do it anymore. Contrary to what you would think, I was heavily involved in church at this time. I attended a small but impactful church named Jubilee in Detroit. Some of the ladies there were going to a women’s conference in Lansing, MI. The church hosting it was led by a dynamo husband and wife Pastor and Co-Pastor. 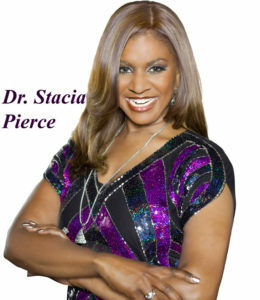 The Co-Pastor, Dr. Stacia Pierce, hosted a conference every year called the Women’s Success Conference. I had never seen anything like it before in my life. Yes, I had been to plenty of conferences, revivals, church concerts, etc. The church I attended before Jubilee was Second Ebenezer Baptist Church in Detroit, which was known all around the city for events. However, what was different about this conference was that all of the speakers where successful Christian women and they each could hold their own. Each woman talked about her area of expertise – Marketing, Marriage, Entrepreneurship, and other topics, each tying their subject to life in general and to God. The show stopper was Stacia Pierce. Boy was she something! She was beautiful, confident, knew the word of God like the back of her hand, and was so stylish! Her smile captivated the room and me. I got a lot from her that day, and I will share one thing that stuck with me. When she talked about turning your life around and the courage it took to walk away from sin and turn to God, she said it may be scary, but so what “DO IT SCARED!” And I am pretty sure she screamed it at us! On the last day of the conference, they had a raffle drawing. Out of all of the women there, which was hundreds, if not a couple thousand, I won! The prize was a TV, I didn’t care anything about the TV, I already had a TV in every room. The significance of my winning that drawing was that God was calling me out. My heart was so heavy from everything I had been through and I could not go backwards. I had finally found my independence and I was in the healing process from losing my daughter. I knew what I was doing was wrong and I wanted to stop but I was scared. How was I going to pay my bills? I couldn’t go back to being homeless. I couldn’t go back to being in need. I was so scared I was literally “shaking.” I will share one of my greatest fears with you. That is being without. I greatly fear not having money and the things that I need. And I greatly covet stability. The way some women greatly desire a man and marriage is the way I greatly desire stability. I can take or leave a man, they have ALWAYS come a dime a dozen to me. Getting a man is like taking candy from a baby. But stability and financial freedom, now that’s my hearts true desire. So, for me to walk away from my source of income was DEATHLY TERRIFYING for me. I was building my faith in God, but sometimes we need an earthly example. That was what these women provided for me. Particularly because they represented the kind of woman I wanted to be. Up until that point I had a vision in my head of what I was seeking, but I hadn’t really seen it. I have always had good women in my life, this is true, and I love them. But none of them were what I was aspiring to. This was the first time I saw the total package that I was seeking. Stacia was educated but not snobbish. She was smart and had her own business. Then she also had the Godly side. She knew the word of God and slayed you with it, but in love not judgement. She was beautiful. She had style and was sassy. She was married but not dependent on her husband. She honored him but it was CLEAR she could stand on her own. I bought some of her materials and tapes (lol at tapes) and I listened to them over and over in the following years to come. When I came home from that conference, I was a changed woman. I went to work that next week and I was completely frozen. I couldn’t move and now everything in the bar was magnified times 10. The next day I talked to the manager and said I needed a break from dancing and wanted to waitress for a while, he said okay and I started the next day. While I was carrying drinks to somebody’s table, God stopped me dead in my tracks and I heard “I said I don’t want you in here at ALL, that’s enough!” I stopped that night. Over the next few months it was hard while I was looking for a job and had no money coming in, but is was also one of the most peaceful periods of my life. I lost some things, for example my car was repossessed. I was scared, but I kept right on going. I was changing my life for God and I could feel Him with me. I found a job, and within a couple of months I found an even better one. Now let me tell you about my best friend Danietra. She is one of the bravest women I know. She doesn’t let anything stop her. When she has a goal, you better watch out because she is GOING to accomplish it! She is also one of the most beautiful women I know. I always tease her and call her Black Barbie. I call her that because she is so pretty to me that she looks like a Barbie doll. I loved Barbie dolls when I was growing up, and I love her. Danietra is married to a great guy named Harold, and they have two amazing children, Justin who is 17 and Kendall Joy who is 9. She is totally committed to her children and giving them a wonderful childhood. One of her greatest desires is to make sure they have every advantage and opportunity for their future. You see that is something we share in common, we both feel that we didn’t get the opportunities that we needed to live life to our fullest potential, and we are fully committed to ensure that our kids don’t feel the same way. Danietra is so set on giving her family the best opportunities that she moved across the country to do it! In May of 2008, she moved from Detroit to Tennessee. She had been looking to move for some time, and felt God led her there. At first it was scary, but she and her family did well there. Danietra and her husband Harold found work, but the best part was the doors of opportunity that were opened for her children. Justin plays baseball and Kendall Joy works as an actress. Justin had more opportunities for education, sports, and worked in the film industry with his dad. He is now a senior in high school and is working his first job. Kendall Joy has been in movies, commercials, music videos, restaurant ads, and held the state title as USA National Miss Tennessee Junior Princess at only 4 years old. Both of her children received the Presidential Volunteer Service award from President Barack Obama in 2013. 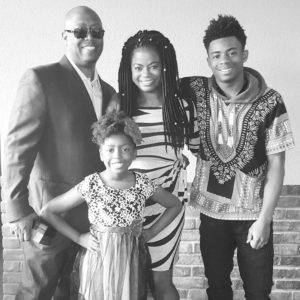 Danietra decided that she wanted to expose her family to even more opportunities and recently made a move to Los Angeles, California. Her husband is working to become a film maker, her daughter a successful actress, and Justin plans to attend school for photography and film editing. And Danietra is managing it all. This move was scary. She had to give up the life she just spent 8 years building in Tennessee. Although she and her husband both work hard to provide for her family, the cost of moving to an expensive city such as Los Angeles is a huge sacrifice. She was scared, but she didn’t let fear stop her. She made a plan, and executed it. Now as of July 1st she is living in California! Change is scary. Even when you are doing the “right thing,” doing something new is scary. You may desire a new job. Leaving a job that seemingly provides security, but is really a trap in the pit of hell is scary. It is scary to leave a steady paycheck to pursue your passion. You may want to go back to school. Going to a new school is scary for children, but going BACK to school as an adult is even scarier. You may ask yourself “How will I pay for it,” or “how will I have the time to work, take care of my family, attend class, and study?” You may be starting a new relationship, or ending an old one! Are you thinking of leaving an abusive or unhealthy relationship? I know it is scary. It may change your financial situation and even your stability. It may affect your children. As women we worry about looking like a failure if our marriage fails, especially if you are in a church environment. Even seemingly small changes can be scary – a new hair color or cut, that dress that you have been wanting to wear, or a new lipstick color. You may feel like that scene on the horror movie Carrie “They’re all going to laugh at you.” Don’t worry about what people will think, take a risk and do something new. Whether it is big: a true life change – Or small: a new dress. Whatever is your heart’s desire and God’s will YOU CAN DO IT. Writing these blog posts and telling you all about my past is scary. When I was planning to start this blog, God told me “Just start writing and I’ll do the rest.” So, that is what I am doing…..scared and all. I’m doing it, and you can too. I am truly happy that you were motivated. I wish you the best as you move forward towards whatever is your goal. Yes…YOU ARE walking in your purpose and it, my lovely pint-size, powerhouse friend is GREAT!!!!! This is powerful and shows so much self-awareness and determination Bless you in all that you do.